Announcing: Three Speed Adventure April challenge! Hello friends. You know I love bike challenges. First, it was my THREE SPEED OCTOBER challenge. Now, just six months later, I am introducing THREE SPEED ADVENTURE APRIL! What exactly is this challenge, and how is it different than the October challenge? Well, this challenge is about doing things with/on a three speed bicycle that some people would unfairly consider “beyond its abilities”. These bikes are more able than even some seasoned three-speeders think! Ride your three speed at least fifteen miles (25 km) in one ride. 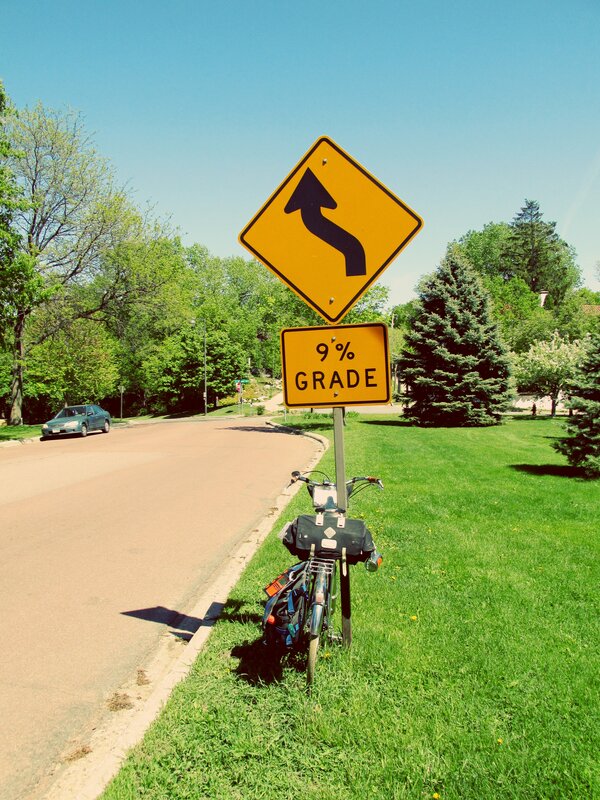 A climb of 5% or more grade, with a cumulative elevation gain of at least 100 feet (30 m). A bit of unpaved/dirt action, of at least a cumulative one half mile (1 km). Coffee outside via three speed. 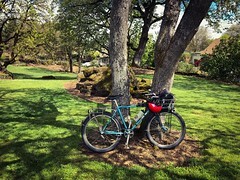 A bike overnight or bike camping trip by three speed. When will it happen? The Three Speed Adventure April challenge will occur during the full calendar month of April, which in 2017 is Saturday April 1st through Sunday April 30th. So your ride(s) can happen anytime in April. Why April? For many in the northern hemisphere, it’s spring! Yeah, I know some places will still see some snow for a bit, but I’m pretty sure you’ll have a couple days of no snow on the ground and mild weather. Or, if you live in a place like Phoenix, it’s the last tolerable riding weather until October! And if you live in the Southern Hemisphere, it’s the start of fall, so a good time to get some rides in. In any case, it’s generally an OK time to be riding a bike wherever you are on this planet. Why three speeds? If you are already here do I need to answer that? 😉 Okay, it’s because three speeds are totally reasonable and practical bikes for many an application. This challenge is to encourage you to think about them in this way, rather than a “show” bike for your Tweed Ride. Is this just limited to three speeds? Well, yeah. A three speed internally geared hub is what should be ridden for this challenge. We’ll also accept four and five speed internally geared hubs, hubs that were available from Sturmey-Archer by the mid-70’s. But no more or less speeds than that! To be clear, it doesn’t have to be a Sturmey-Archer hub, it can also be a Sachs, Sram, Shimano, SunTour, Hercules, or (insert brand here.) But it can only have three, four, or five speeds! Any exceptions? We’ll allow Bromptons that have that infernal Sturmey-Archer with deraileur combo, but that’s it. And if you use a Brompton, you will need to disable the control of the derailleur, and provide proof of it. Sorry, it’s too easy to cheat otherwise. Note: I said “disable”. You don’t have to remove the derailleur itself, just make it unworkable. Do I need to do each as individual rides? No! This isn’t the October challenge, which is more concerned about frequency, this is about getting it all done. So if you can do a ride that hits up all five sub-challenges at once, go for it! 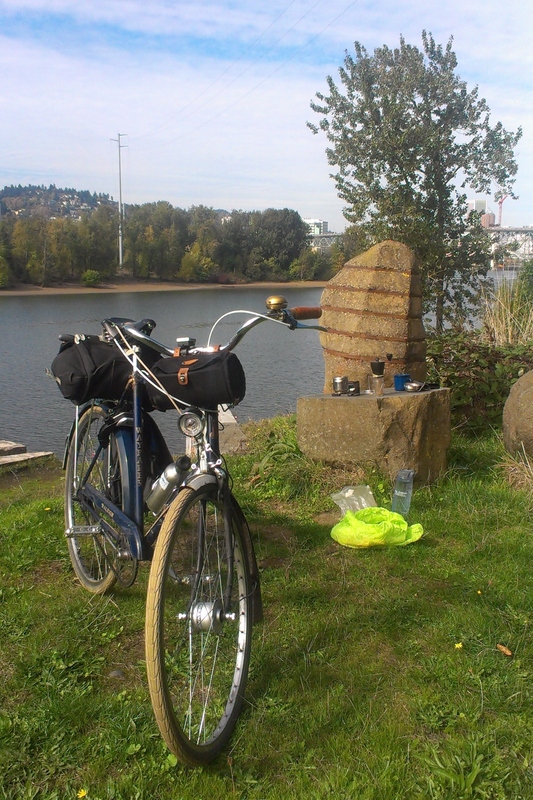 You can of course do other combinations, like a dirt ride with coffee outside (two sub-challenges). What if I can’t do all five sub-challenges? No worries. I understand that all five of them are not going to appeal to or be possible for everyone, so do what you can. You get a button for each challenge you do. If you hit at least three of the sub-challenges, you get a patch. If you can do all five, great! But you won’t get something else beyond five buttons and a patch. We’ll get more into the “prizes” soon. Map the ride later with a computer. We recommend using Ride With GPS for this. A paper map and estimating distance through old-school map-reading tools. 2. A climb of 5% or more grade, with a cumulative elevation gain of at least 100 feet (30 m). It’s no secret that three-speeders shy away from hills, so this challenge is to prove your old humble Huffy Sportsman is more nimble than you think. 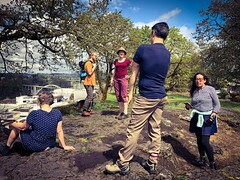 A five percent grade is generally what people feel is a “real” hill, so you’ll need to find a hill of at least that grade, and the hill should have a total elevation gain of 100 feet (30 m). And note, I don’t mean distance. Riding for 100 feet would be too easy (that’s half of one of our already too short city blocks in Portland!) It’s about elevation gain. If you can’t find a hill with that much gain, you can stitch together two or more hills in a single ride with at least 5% or more grade, or just go up and down the same hill until you hit 100 cumulative feet. Yes, Minneapolis, you have steep enough hills for this challenge. This is found on Kenwood Pkwy south of downtown. Now how can you figure out grade? 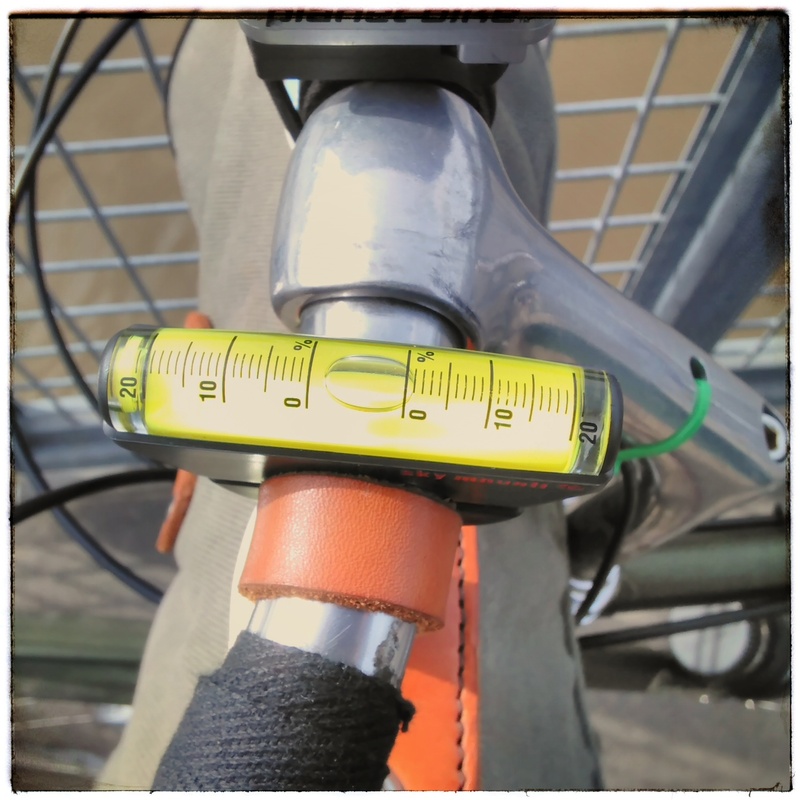 Well, you can get yourself a bike-specific inclinometer, like the one pictured above made by Sky Mounti (about $25). Or, you can use Ride With GPS and map out the route, as it shows both elevation gain and grade. 3. A bit of unpaved/dirt action, of at least a cumulative one half mile (1 km). We often forget how long the British three speed has been around. It was around in an era where not every road was paved. Not only that, but Great Britain has many a country path to be explored, and people were exploring them on three speeds! So a little “rough stuff” was typically part of a three speed adventure. And there’s no reason why you can’t do some dirt on your three speed! While the tires are not wide-wide, the average 35 mm width on old 26″ x 1 3/8″ is good for mixed terrain. Now, this does not mean you have to do true technical single-track mountain biking on your three speed, but hell, if you want, you can! No, I’m pretty liberal in the definition of “unpaved/dirt”. It just does not have to have a permanent surface like asphalt or concrete. So gravel, dirt, wood chip, even grass! I’m sure that even the most urban environment has a little bit of that. You just need to do at least one half mile cumulative of it. 5. Bike Overnight. Yes, people automatically reach for a purpose built touring rig for an overnight these days, but “back in the day”, that rig would be a three speed. 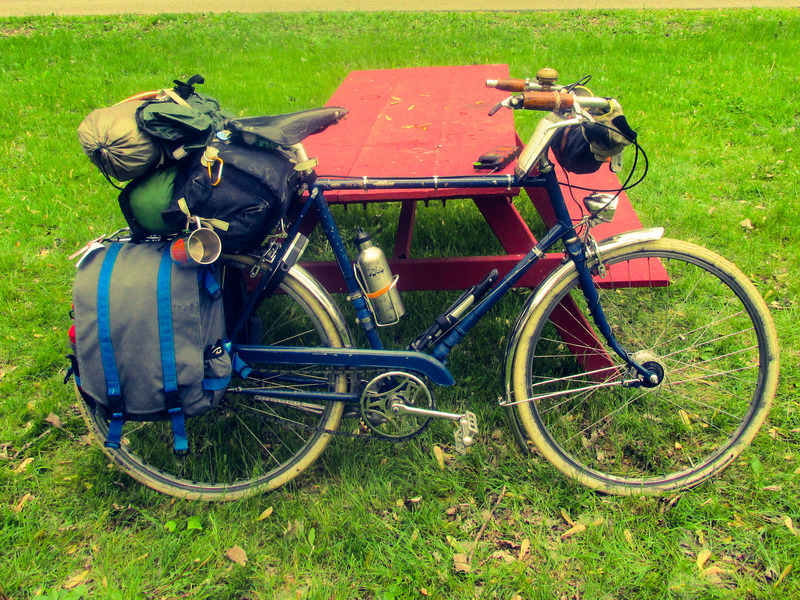 And there’s nothing wrong with doing a little touring action on your humble internally-geared bike. I’ve done overnights and tours on my three speed! The ride must be at least three miles (one way). You must spend one full night at the destination. You must (theoretically) pay for your night’s stay. This means you can not just simply ride over to your friend’s or family’s house and crash for the night or camp in their backyard. The place has to be a legitimate lodging facility if it is indoors, or a campground you pay for if it’s outside. Saying that, you don’t have to exactly “pay”. You can stealth camp or use a free camping spot if you are staying outside (though you have to be a bit more creative than “in the woods down the street”), or use a free hospitality service like Warmshowers or Couchsurfing if you are staying indoors. This ride must be self-contained, meaning you will need to carry everything you need on your bike. No vehicle support allowed or “dropping off” of stuff in advance. You can use public transportation! You can take a bus or train to a certain spot, then ride the rest of the way in. 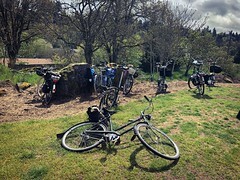 Please note that you would have to ride at least three miles after getting dropped off and then carry all the stuff on your bike from the bus/train. Whew! Glad you made it through all that. Hope it all makes sense, and isn’t too complicated. Feel free to comment or email if you have questions, or need clarifications. Register. Please drop me a line at urbanadventureleague@gmail.com if you want to participate. You don’t need to “register” by April 1, though. Notify. Now, this is the important part. During the last challenge I quickly realized how hard it was to keep track of everyone, so now I want you to let me know via email or post what you’ve done. You can let me know as you do each challenge (so I can put it up in my weekly reports) or when you’ve done everything. You’ll have until Wednesday May 10th to get your reports to me to qualify. I will not accept anything from Facebook or Twitter, sorry. If you do post on Instagram, flickr, or tumblr, please tag your entries #threespeedadvapr2017 And please remember that you will still need to email me to let me know what’s up! And finally, Prizes! For every sub-challenge you complete, you will qualify for a button. People who complete three to five of the sub-challenges will qualify for a patch! I am still working out the details of all that, but since making this stuff is going to cost money, I will have to ask for some cash if you want to get those. Details are still being hashed out. I will post them when they do finalize, so please do not ask before then! Alright folks, get on your three speed and ride! Well, I did number 2. 100 feet in slightly more than 1/3 mile, works out to about 6%. Since the only “tracking” app I had installed just before I set out was Google Fit, I used that. Unbeknownst to me at the time, it’s not exactly easy to export data from Google Fit in any useful form. It’s beknownst to me now, though, and I’ll use Strava or some such next time. REMINDER: Three Speed Ride THIS SUNDAY, April 2!